Place the passion fruit, heavy cream and fresh milk in a pot and cook at medium heat until it begins to boil. Remove from the heat. Whip the yolks, sugar and inverted sugar syrup until creamy. 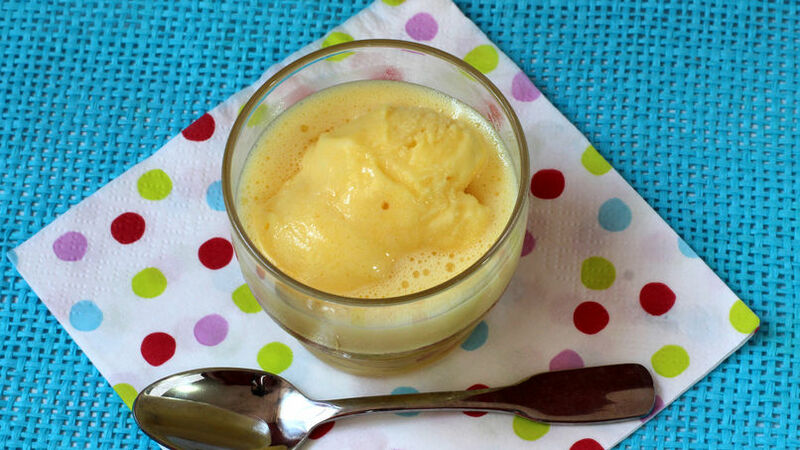 Mix the passion fruit cream with the whipped yolks and cook over medium heat until it begins to boil again. Remove from the heat. Whip with a hand mixer until very creamy. Let sit at room temperature until completely cool and place in the freezer in a freeze friendly container. Use a plastic bag or glass. Remove from the freezer every hour, whip quickly and freeze again. You should repeat this process 4 or 5 times until you have the consistency of ice cream. Passion fruit is usually sour so I recommend testing the sugar. To prepare the inverted sugar syrup, you'll need 2 lbs of sugar, 2 cups or water, 1 teaspoon of lemon juice and 1/4 cup of baking soda. Boil the ingredients in a pot. Remove when it begins to boil. Use a spoon to remove the white foam. Boil again and let cool completely before using. You can keep in a sealed and sterilized container. Passion fruit is a tropical vine fruit. In Puerto Rico it was very common to see vines wrapped around the light posts in rural areas of the island, but nowadays the fruit is scarce so we often have to turn to concentrates or pulp. Passion fruit can be consumed fresh or used to prepare ice creams, sorbets, juices or pastries. At home I usually use concentrates to prepare juice or frozen treats. I also use it in dressings and sauces for fish. This time I want to prepare an ice cream to help fight the intense summer heat.